In this post: Grab your Shepherd hat and join us as we learn about King David with yummy treats & fun activities! Hello, Dear Ones! I hope you had a lovely Christmas! Technically it’ still Christmas time until Epiphany ;). So I have time to catch up on Christmas posts. We really had fun as a family and in Tot school. I wanted Leeland to understand the basic elements and characters of Jesus’ first Advent. We were also learning about important people in Jesus’ bloodline and in the history of God’s redemption plan. King David is super special because Jesus comes from David’s family. I told Leeland that King David was Jesus’ Great Grandpa. I know there are many “greats” before that but that was above Little Man’s head and I wasn’t about to count all the greats! Ha! So what ensued this week, was a study of shepherds since King David was a shepherd boy and there are shepherds in the Nativity. We also had fun with candy canes because they look like a shepherd’s hook. Here’s how we learned! Reading The Candymaker’s Gift and eating candy canes of course! Candy Cane crescent rolls- I added a small amount of red food coloring to our butter and painted it on the crescent roll, which I had twisted into a candy cane shape. I did this before I baked it. Shepherd Play with Little People and books (and a movie) about David– After reading books and watching a movie on King David, we played out the story of him killing the lion and bear to protect his sheep. We read two other sweet Christmas books. A prayer and also a book about the visitors to the “inn”. The board book has flaps to open and see who’s visiting the “inn”. Hide n’ Sheep- This is an original game that I thought of while trying to keep Leeland busy. Basically, I hid the sheep and he had to find them. I would “baaa” if he was close. Once he found the sheep he took them back to their “pen”. I clapped and said, “You’re a good shepherd. You take good care of your sheep…just like Jesus takes care of us.” Leeland loved it! Shaving Sheep- I believe I found these cardboard sheep at the dollar store. I sprayed them with shaving cream and Leeland scraped it off with a closed razor. It was like he was shearing the sheep! King David’s Harp Craft– David was a skilled musician and psalmist. Both of my boys worked on harps. Leeland colored popsicle sticks. Nana glued it together for him and I put on rubber bands for the strings. Leeland played with it a bit and then I turned the harp into an ornament for the tree. We continued with sheep fun and watched Shaun the Sheep. Sheep Balloon herding– the boys had fun throwing these sheep balloons. Leeland wasn’t interested in “herding” them into their pen, but it was a cute idea from Pinterest. Shepherd Painting– Leeland dressed up as a shepherd and I took his picture for a mixed media painting. I cut the cardoard sheep so they would fit on the paper in different ways. Leeland glued cotton balls onto them. Leeland colored a rod I had drawn and then he painted over it with watercolor for a pastel resist effect. 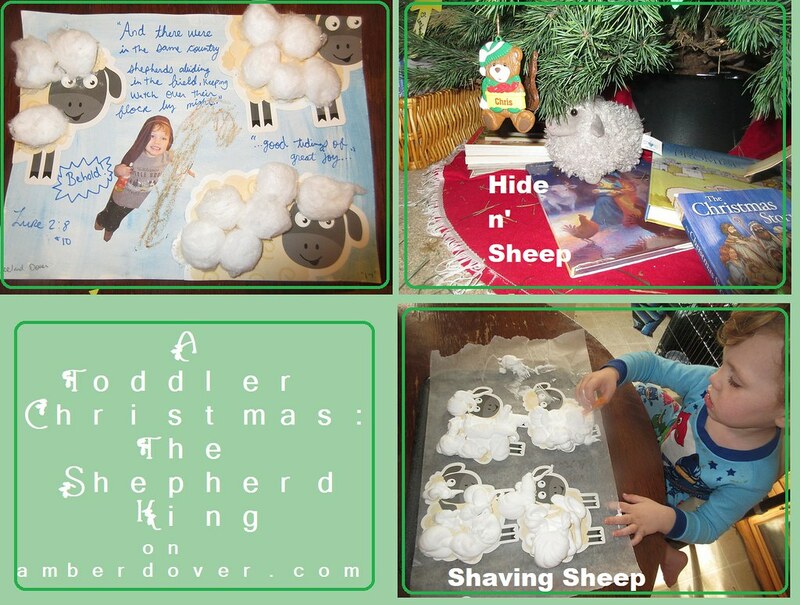 I added Leeland’s picture and the sheep to make a shepherd scene. Then I wrote the story of the shepherds in the Nativity. Shepherds were smelly loners and outcasts, yet God sent His message to them. God had come for us all…not just the rich and presentable. No one is alone truly. God always sees you and He wants you to be close to Him.